A great first full day in Jordan. We started by visiting the birthplace of Elijah, then Mass at a church that just experienced a miracle of Mary (Fr. Conlon’s Homily), then a great authentic Jordanian lunch. 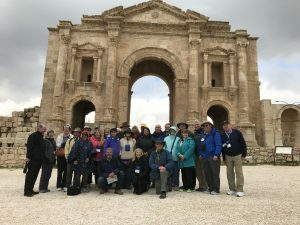 In the afternoon we visited to the exquisite Roman ruins of Jerash. Then we visited the Jabbok River where Jacob wrestled with God and I wrestled with Fr. James! Here Jacob and was given the new name of Israel. Enjoy!